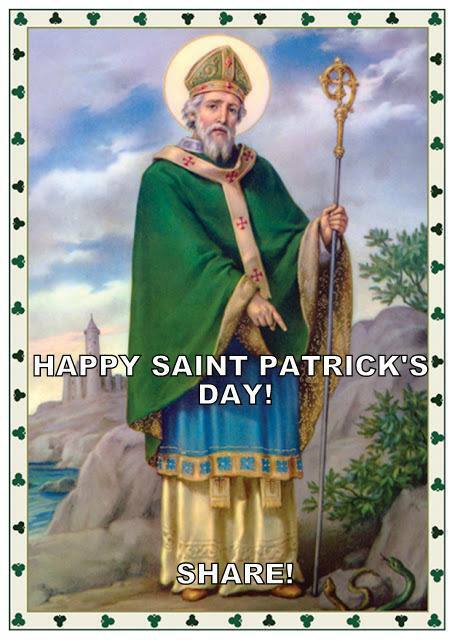 March 17 is one of the most widely recognized feast days throughout the Church, the feast of Saint Patrick (387-493), patron saint of Ireland. Many myths and legends have arisen regarding the life of Saint Patrick, some culturally-based in Celtic oral storytelling, and some much more modern in support of non-spiritual celebrations. Church historians have compiled the basic facts of Saint Patrick’s life from letters and Confessions that he wrote while alive, as well as survey of the political and historical landscapes of the time. Many of the legendary miracles reported to have been performed by Saint Patrick remain unverified by history, but for many verified by faith in the gentle man responsible for bringing Catholicism to Ireland. I saw a man coming, as it were from Ireland. His name was Victoricus, and he carried many letters, and he gave me one of them. I read the heading: "The Voice of the Irish". As I began the letter, I imagined in that moment that I heard the voice of those very people who were near the wood of Foclut, which is beside the western sea—and they cried out, as with one voice: "We appeal to you, holy servant boy, to come and walk among us! Patrick felt called to return to Ireland, but wished to be ordained prior to his departure. He undertook rigorous religious study, lasting approximately 14 years, during which time he was first ordained a priest, and later a bishop. Only upon becoming bishop did Patrick feel prepared to return to Ireland. While some legend suggests that Saint Patrick introduced Christianity to Ireland, it is far more likely that some small Christian communities existed before his second arrival. His dual mission was that of ministering to the existing Christian communities and converting others to the faith. Saint Patrick had great success on both accounts, drawing from his familiarity of Celtic and Druid religious beliefs and language. He introduced natural elements into his teaching, including placing the sun on the Celtic Cross as symbolization of the Godhead, illustrating the Resurrection of Christ through the use of bonfires (symbols familiar to the Druids), and most famously, explaining the Holy Trinity through comparison to the shamrock. Many were converted by his works, and monasteries and convents established (although their formal structure and organization would not be complete until centuries after his death). During his ministry in Ireland, Saint Patrick lived a poor and austere life, accepting only what he needed to live. He was repeatedly arrested and imprisoned, threatened and attacked by chieftains of warring tribes, and suffered great peril. Throughout all struggles, he remained fearless, looking to the Lord for guidance and comfort, and demonstrating great love, humility, and charity towards all he encountered. Numerous miracles and intercessions are reported in his name. I bind to myself today The strong virtue of the Invocation of the Trinity: I believe the Trinity in the Unity The Creator of the Universe. In purity of holy Virgins, In deeds of righteous men. I bind to myself today The power of Heaven, The light of the sun, The brightness of the moon, The splendor of fire, The flashing of lightning, The swiftness of wind, The depth of sea, The stability of earth, The compactness of rocks. I bind to myself today God's Power to guide me, God's Might to uphold me, God's Wisdom to teach me, God's Eye to watch over me, God's Ear to hear me, God's Word to give me speech, God's Hand to guide me, God's Way to lie before me, God's Shield to shelter me, God's Host to secure me, Against the snares of demons, Against the seductions of vices, Against the lusts of nature, Against everyone who meditates injury to me, Whether far or near, Whether few or with many. Christ in the fort, Christ in the chariot seat, Christ in the deck of ships, Christ in the heart of everyone who thinks of me, Christ in the mouth of everyone who speaks to me, Christ in every eye that sees me, Christ in every ear that hears me. I bind to myself today The strong virtue of an invocation of the Trinity: I believe the Trinity in the Unity The Creator of the Universe.